A native perennial arising from rhizomes, Viola praemorsa is a plant of many names. Not only does this species have several subspecies, it is also known as Viola nuttallii var praemorsa. Its common names include canary violet, Astoria violet, prairie violet, yellow montane violet and upland yellow violet. I simply call this pretty yellow spring flower canary violet and consider its scientific name Viola praemorsa, without worrying about the subspecies. In the Western United States and Western Canada, canary violets can be found in dry mountain forests and grassy meadows. This particular plant was growing on the trail to the south side of Baum Lake (Shasta County CA). Canary violet leaves are somewhat fleshy, lance-shaped, hairy and have a long petiole. A single yellow canary violet flower rises above each small cluster of leaves. The bright yellow flowers have five petals and display bilateral symmetry. The lower three petals are lightly veined maroon or brownish purple. I takes two years for a plant to become large enough to flower. The yellow, showy flowers seen in April and May are cross-polllinated. Later (May and June), depending on weather conditions, inconspicuous, green, self-pollinated flowers appear near the base of the plant. When mature, the seeds are explosively ejected from capsules. By midsummer canary violets usually die back. Like all violets, canary violet flowers are edible in reasonable quantities and can add color to a green salad. The leaves contain saponins, soap-like substances, and may cause digestive upset and vomiting if consumed in large amounts. 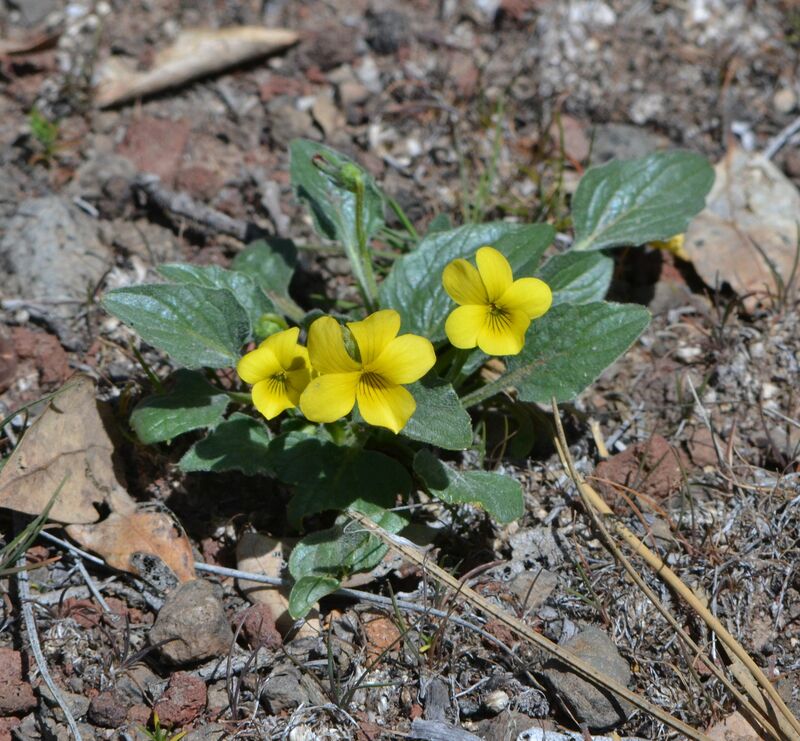 In my opinion, like most wild violets, canary violets are too small, pretty and rare to harm. Canary violets should only add a bit of color to an early spring walk. This entry was posted in Wildflowers and tagged Astoria violet, canary violet, nature photography, prairie violet, upland yellow violet, Viola praemorsa, yellow montane violet. Bookmark the permalink.